This is the Original lot 1867, opened Sept 2015, gassed after each use, 2/3 full when sample was poured April 18 2018. With water, there’s a rush of vanilla on the nose followed by maple sugar and oak notes. On the palate there’s more fruitiness, oranges and apricots, but the body becomes much too thin with a scant half-teaspoon of water. The finish doesn’t change much with water, but the currant note is replaced by a slight bitterness at the tail end. This is definitely better without water. The nose of this whisky is phenomenal. The flavour and finish are very good, but don’t quite deliver on the nose’s promise. I kind of wish I could have removed the water after I added it. I really wish this one was bottled at 46%-48% ABV. Would I spend $75 on this whisky? I’m not sure. If I did, I’d only drink it neat. @paddockjudge I don’t doubt it. I feel it was quite diminished by the addition of water, though even neat there was a discrepancy between the beautiful promise of the nose and what I perceived on the palate and finish. That said, a review from one sample, at one moment in time can only go so far, which is why I fully disclose all the pertinent information. @Nozinan His liver has definitely seen better days....maybe that's why he never wanted to increase the ABV! I have wanted to do a batch review of this one for some time. This whisky is partially matured in Canadian Oak casks, being the only major whisky producer to do so. These very carefully made casks are limited in quantity, but have quite thick staves (1.5"), which means that they can be re-used and rejuvenated for a longer period than regular casks. Regardless, the interaction with the wood is a bit different each time - and I've been interested to see how the batches change, if indeed they do. This bottling is from batch D, and I have already reviewed batch B, which was one of my favourite whiskies. Below the review is a direct batch comparison from some of my samples I had left over. Weighting the nose 25%, taste 35%, finish 15%, and intrigue 25%, the overall score is 88. After conducting an initial review, I was quite surprised and conducted three reviews (two blind) with both batches - and my suspicions were confirmed. This bottle I have of batch D is certainly not as good as batch B. On the nose, B is far richer, vibrant - alive - with more going on and fitting together much more in balance. On the palate it's sharper, clearer in definition, and with more flavour - more fruit and earthiness, for sure. It leads more slowly into a longer finish. The finish is also cleaner, and bigger, with more development. Overall, as I've said, richer, longer, and more elegant. I've only tried the first batch. I have a sealed bottle but I was saving it to give to my children in the future as part of whisky history. Are there multiple batches available or currently just the D at LCBO? There's no hiding that this is my favourite regularly-produced Canadian whisky, so I'll say it outright. It's produced in the Forty Creek "meritage" style, made from a mix of single grain corn, rye, and malted barley whiskies blended together before 2 years of finishing in Canadian oak. The barrels were made under the supervision of John Hall, whisky maker at Forty Creek, out of 150-year-old trees from near the distillery. The batches have varied a little, and likely they will continue to do so - but I certainly hope (and expect) that the quality of this whisky will continue. With a considerable number of barrels made from the trees acquired by John Hall, and the very thick barrel staves (allowing for recharring/rejuvenation of the wood), this whisky should stay consistent and wonderful for quite some time. This reviewed batch is from 1867-B, and I was stunned when I tried it right out of the bottle, and when I reviewed it some months later. Now, it still stuns me but the conditions have to be right. However, a sample I tried last year from the distillery was also fantastic though I believe it was the same batch as mine. @Nozinan I recently tried batch D and was quite dissapointed. So I picked out some samples of B and did a comparison and - my suspicions were confirmed - the quality was vastly different. Too bad. I never tried C so I don't know what that one was like. Excellent, well made review. Mouthwatering. The Forty Creek Confederation Oak Reserve, by Kittling Ridge from Grimsby near Lake Ontario, matured on new Canadian oak that was heavily charred. The Canadian oak, according to owner John K. Hall, contains a larger quantity of vanillins because of the colder winters. The nose is not quite as sweet as anticipated. It is even somewhat meaty from smoked ham and tart as lime juice. Then some tobacco, vanilla and caramel, but rather soft. Very malty and not as hot as you would expect from a rye whisky. A lot of buttercups and hints of a drying fire. Dry. It is mouth coating, but not creamy. The sweetness of the vanilla soon turns sourish like gooseberries. Quite some pepper. Breakfast cereals. Lightly smoke from the oak. Wood shavings. Barbecue Sauce! You know, the kind you use to cover your ribs in before putting them on the grill. This is pretty good. The finish is medium long, light on the spices and drying from the casks. This Forty Creek is the other way around. The nose is okayish, but the palate is very good. It even wond the Canadian Whisky of the Year Award in 2010 and 2012. With thanks to my Canadian friend Jean-Francois for the sample. If this Whisky had a craft presentation it would score in the 90s. It has a wonderful nose, warm, spicy, with caramel and vanilla. Taste is a little dilute, but warm and caramel, with the vanilla in the background, transitioning to spicy with a warm, abrupt finish. 43-46%ABV, non chill filtration and no caramel would raise this to another level. This is the only Whisky I know that uses Canadian oak in its maturation. In the three years since I wrote this review I have developed a much greater appreciation for the subtleties of Canadian whiskies, and have had the chance to try a few more styles. Tonight I amended my score by add ins 2 to the finish... I'll think about it more. I've recently opened my second bottle of Confederation Oak (original batch) and it is simply fantastic. Sipping this one (my second bottle now open 4 months and gassed), if you like caramel and vanilla this batch is for you. The nose is opening up in my mini glencairn as it takes on oxygen, with some floral notes, and the taste is becoming less spirit and fuller. Not sure it is an 87 whisky but the more I enjoy this the more I'm inclined to leave my updated score the same. Before I tidy the house in anticipation of a lovely (ahem) female visitor this evening, I thought I would try my second Canadian whisky of the weekend. Forty Creek is perhaps the most vibrant and interesting distillery in Canada today. It is actually part of Kittling Ridge winery and was built in 1970 to make eau de vie. John K. Hall, easily Canada's best known distiller (does anyone know the names of any others working today? ), bought it in 1992. Coming from a winemaking background, he experiments with lots of different casks and approaches to whisky making. Michael Jackson called Forty Creek "the most revolutionary whisky in Canada." Finding some oak trees near the distillery (that had been there since Confederation, hence the name), he matured the whisky in casks hewn from those oaks rather than the usual ex-bourbon barrels. These oak trees have a much tighter grain than American oak (due to the colder climate) which I am guessing causes the oakier vanilla elements to come through. All the bottles are designated lot 1867 (ha ha) and 16,800 bottles have been released. John Hansell of Whisky Advocate called this the best Canadian whisky he has every had - let's see if he's right! The colour is a light gold with coppery highlights. The nose is extraordinary: light maple syrup, bubblegum, a hint of anise, coconut extract, raisins, orange, and lots of toffee. Very complex, sweet but never cloying. Water seems to have little effect here. In the mouth, very creamy and buttery, yet also quite oaky (as befits the name), but just enough. A little more oak would tip it over the edge. Very fruity - you could drink this in the morning and it would be like an orange-vanilla-buttery...something. Or for dessert, with this butterscotch and praline, with a little white pepper. Scrumptious! Just sweet enough, just oaky enough. This is wonderful. The finish is long and rich. You want to just sit and let the dark fruits, sweet toffee and hint of pepper just linger in your mouth. To say there is lots of vanilla going on across all senses would be an understatement. This is without a doubt one of the best Canadian whiskies I've had (up there with Wiser's Legacy and Gibson's 18), and is a true representation of the best that our style has to offer. If I find another bottle (this one was the last at the LCBO I went to) I will definitely pick it up! NIce review for sure. I certainly enjoy the Confederation Oak a lot and it does give Wiser's Legacy a run for its money for top of my Canadian List. A couple of nice Canadian drams and an evening with a lovely lady to look forward to sounds like a very Happy Canada Day indeed!! There has been zero "wow factor" in my sister's bottle of Confederation Oak. Fruitiness? I don't remember any at all. Maybe yours and others' have been better bottles. I'd like a sip from your bottle. Forty Creek whiskies are made at the Kittling Ridge Distillery in Grimsby, Ontario. The reviewed bottle is # 06447 from lot # 1867. The bottle has been open for 4 1/2 months at the time of this review. Nose: moderate intensity very pleasant maple and vanilla, with slight honey sweetness, and a slight scent of rose. Taste: sweet high-pitched maple wood flavours, including vanilla and strong caramel, with strong supporting and contrasting rye spice flavours. I find the flavours to be somewhat less aggressively sweet or aggressively spicy than those of the Forty Creek Barrel Select whisky. There is plenty of flavour here, though this is much more caramel-y than I would prefer. At 4 1/2 months of the bottle open the flavours of the wood harmonise better with the spicy rye grain flavours than they did when the bottle was first opened. Finish: this whisky does a very nice slow gradual fade out with all of the elements remaining strong for a long time. Balance: Forty Creek Confederation Oak has some nice flavours present. To my palate this whisky screams out for needing some additional bass notes from the wood for balance and optimal harmony. A lot of people like this whisky. For me it is just ok.
Nice review on the Confed Oak. Knowing the host enjoys Canadian whisky, I brought along an unopened bottle of Fourty Creek Confederation Oak ( Lot 1867, bottle 03764) -- we managed to do a very nice dent in the bottle. You are right in stating that the caramel-y flavours are very present in this release. I found I much preferred it on ice as opposed to neat. Once we got the cigars going, it did mellow somewhat - maybee my taste buds where getting mixed signals. Nonetheless, I very nice Canadian whisky for me... probably be around the score you gave it. 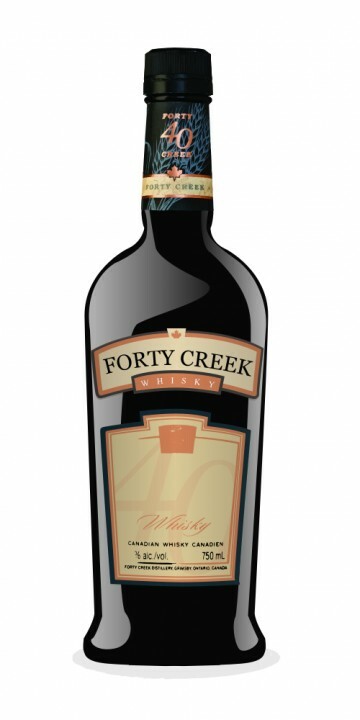 is the fact that this has been the largest bottling of the specialty offerings from Forty Creek. Another little item...it would seem that John Hall had a little fun with the lot 'numbering' for this release. All bottles are from 'Lot 1867' as it refers to the year of Canadian Confederation (yes, Canada will officially turn 145 years old next July 1st), in keeping with the Confederation theme of this release. Once again, it took me half a bottle to realize that I had something special in my hands. Confederation Oak Reserve seemed rather hot, prickly at first, and also reluctant to reveal its character. After having the bottle open for a week, only then did I begin to marvel at what a great whisky it is. Nose: sweet and herbal like Wiser's Lecagy but richer, more rounded, and less fruity. Perhaps the corn and barley malt speak louder than the rye in this blend. Soft and inviting, there is a sweet bread-like aroma. Taste: crisp yet soft, it is all woodsy here. Pine forest. A very clean oakiness, not at all like a charred bourbon taste. Very unique delivery. Develops a balancing sourness mid-palate. Also coffee beans. Finish: sweet and sour, with lasting wood notes. Again very clean. This whisky stands up to everything I pit it against. Seems expensive, but worth the money. ThisWhiskey created by John K. Hall and the folks in Grimsby Ontario have created an instand Canadian classic. This whisky just won the award for Canadian Whisky of The Year and it does not disappoint. Nose: Subtle yet strong. Butter cream with a floral opening along with a bit of rye spice. The sweetness of the corn piece from the blend is apparent in the background. Some fruit pulls though, orange and apricot. The last hint of the scent shows a nutty characteristic along with a slight tingle of spice on the nose. Pallet:Creamy rich and a little bit of spice. "Warm all the way down" my father said. The sweetness of friuit and floral notes start with a bang and carry out until they pass off to the toasty nutty notes. The malty characters worth with the corn for a ssweetness and the rye takes away the finish to giv that slight 'tingle' on the tongue. "Confederation Oak" is the right name for this. The finish is just like breathing in a dry oak fire. I don't usually leave my glas to smell the next day but in this case I didn't anyways. I forgot the glasses in the basement where we had been watching the game and when I brought them up to be cleaned I smelled one of them: Fresh cut oak, and a rich and "powerful" oak scent. This whiskey will keep the glass smelling for days!! Thanks for the welcome! A toast to you!! Welcome aboard, @Reece3253, and great first review! I'm glad you enjoyed the Confederation Oak so much. It's one of my favourites, too. Recently, the Forty Creek distillery of Grimsby, Ontario, released their latest expression, Canadian Oak Reserve. Over the launch weekend, I toured the facility and returned home with bottles to complete my stock of the current Forty Creek lineup: Barrel Select, Three Grain, Double Barrel Reserve, and Canadian Oak Reserve. Following in the footsteps of several distinguished members of the Connosr community, I will review each of these expressions over the coming days. Below is a lengthy preamble of Forty Creek’s method; feel free to skip it in order to get to the review that follows. All Forty Creek whiskies are some blend of maize, rye, and barley, though the ages and proportions are somewhat variable. There are no age statements on any Forty Creek release; the consistency of an expression (particularly Barrel Select) is maintained by tasting. They use two copper pot stills—the larger of the pair modified by a short, stainless steel column that keeps alcohol concentrations high (at about 65%)—and they use only the first distillate. Their rye barrels are lightly charred, barley barrels are medium-charred, and maize barrels are heavily charred (also known as an “alligator” char). Forty Creek’s owner and master distiller is John Hall, a winemaker by trade. In the making of Forty Creek whisky, Hall has taken advantage of his vintner’s background in several ways. He founded Kittling Ridge, a winery, to provide funds while his Forty Creek spirits began to mature, and he makes use of the winery’s Kingsgate Reserve sherry casks to finish Barrel Select, Forty Creek’s basic expression. Most importantly, however, Hall’s training led to a simple, but revolutionary, method of whiskymaking. In the production of whisky (from multiple grains), the different grain spirits tend to be combined prior to maturation—a mashbill, for instance, of some proportion of maize, rye, and barley fermented, distilled, and aged together. The grain profiles are thus confounded with one another, such that the moment at which one spirit (such as the maize) achieves its desired profile may not correspond to that of the others (such as the rye and barley). Hall gets around this problem by employing a winemaker’s method, in the Bordeaux and meritage traditions, for each of his Forty Creek releases: maturing each spirit in barrels separately before blending. Once a barrel has achieved its desired profile, the spirit is transferred to stainless steel tanks for holding until the other spirits are ready for blending. Once blended, the final spirit is re-barreled from a period of several months to several years, to finish the whisky and round the final product out. Though Canada is densely forested with the same oak species (White oak, Quercus alba) used in American whiskey barrels, Canadian whisky tends to be matured in American oak. The different conditions under which the trees develop—it’s generally colder here in Canada, for instance—can affect aspects of the wood, such as its density. John Hall was thus curious to see how a whisky aged in Canadian oak barrels would turn out. Hall’s method is the same as before—meritage whisky making—but after maturing the separate spirits in American oak, they were blended and finished in charred Canadian oak barrels. (Never fear, Americans: the wood was still made into barrels by coopers in the US.) His oaks were approximately 150 years old, dating back to Canadian Confederation; hence, “Confederation Oak” Reserve. In both quality and price (~$70 Canadian for 750 ml), it is close to the tremendous Double Barrel Reserve. In my previous review, I called the Double Barrel Reserve "a hard act to follow." Confederation Oak Reserve, however, manages just fine. The nose yields notes of dusty rye, vanilla, toasted pecans and roast corn on the cob. As with the other three Forty Creek expressions, there is some lovely butter here, too. The palate is rye-forward and somewhat dry, again with toasted pecans and some delicious maple syrup. Rye initiates the finish, but it fades gently to a wave of vanilla. Like Double Barrel Reserve, there are thick legs coating the glass, but in mouthfeel, this is also the richest of the bunch. Confederation Oak Reserve is a superb experiment. This and its sister whisky, Double Barrel Reserve, are refined, engaging, and dangerously drinkable. I recommend it highly. Nice to see this whiskey appreciated. I think most people avoid it because they don't feel comfortable enough dishing out 70$ for somthing they haven't tried. I hope that this will help enlighten and support the wonderful complexities that "Confederation Oak" has to offer. Great review! Another brilliant review. Up to now, I never really considered Canadian whisky as an option, when I was in the mood for a new bottle. I must say your review opend for me the doors of a new world. In the future I will see if I can find this Canadian gem around me.